Claudia Ann Teara Christian, this 5'10" tall beauty is currently most famous for her role as Commander Susan Ivanova on the ground breaking science fiction TV series Babylon 5. In addition to what can be found in her filmography she has appeared in a Sega Saturn game Solar Eclipse. 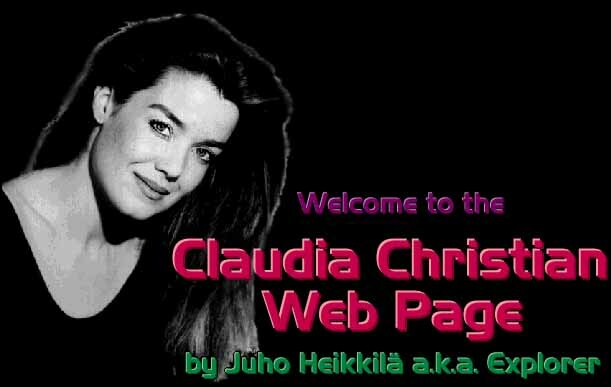 Claudia was born under the Californian sun, in Glendale august 10th 1965, but soon moved to Connecticut where she was raised. She finished high school and moved back to Hollywood before turning 18. Like most other people seeking life in the film industry, she found the typical jobs of waiting tables and clothing stores, until in 1984 she got her first appearance on screen, guesting "Dallas." By 1994 her filmography contained some thirty credits, both on television and on the silver screen, including some roles of weirdos like a nutcase, a stripper, a femme fatale etc. As she puts it, "Been there, done that, worn the T-shirt..."
Any additional or more detailed information would be greatly appreciated. Jonna Parkkonen and Susan Bischoff. This page was awarded on July 22nd 1998 by Links2Go!